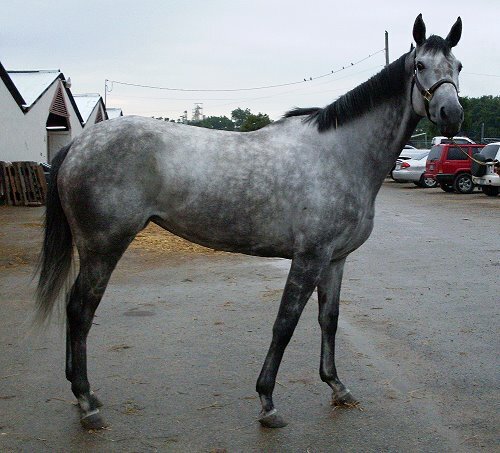 Chipawild was a Thoroughbred horse for sale directly from the track. She was purchased by Sarah O'Connell for her daughter Courtney. Just wanted to let you know that Chipawild’s papers arrived. Thank you. The filly is doing well and my daughter Courtney is calling her “Chipa” (although I suspect it may end up shortened to “Chip”). She has been turned out and after a few attempts figured out how to roll! Orion Farm (the barn she is at) has lots of ponies which she finds fascinating and spends the vast majority of her turnout staring at them! My vet checked her and said she looks great so they are going to start her in a program of learning to lunge and walk, trot under saddle.